"Just by doing a little something, you can change a person's entire day." Random Smile Project provides a bridge of support to people going through difficult times. We recognize and inspire volunteerism, creating a culture of community involvement. We accomplish this through our programs and activities, rooted in the spirit of giving and community. Families who may be down on their luck are provided with clothing, groceries, books and toys through a network of local support. Accessibility options for those in need are provided through our construction and renovation projects like wheelchair ramps, handicap bathroom conversions and home repair. We also award those unsung heroes in our community who put themselves second and others in need before them. And lastly, we inspire volunteerism in the youth of our community through scholarships, playground initiatives and school outreach programs. Through these programs and efforts, Random Smile Project will establish itself as the “Charity of Choice”. The choice for volunteers who sacrifice their time and effort for others; the choice for donors whose generosity makes a difference each and every day; the choice for recipients who will have a means of assistance they otherwise may not have access to; and finally, the choice for the community, who will see how coming together for the greater good is what a community truly is. Random Smile Project is a community non-profit organization. We have ZERO paid employees. 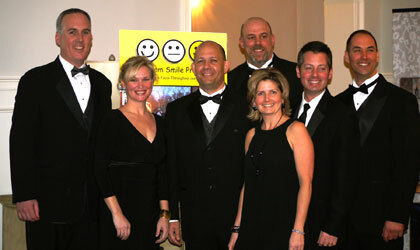 Everyone associated with Random Smile Project donates their time, trades, and skill sets. Since we have no salaries and very limited overhead, you can be assured that your donation will go a long way in our various community endeavors.